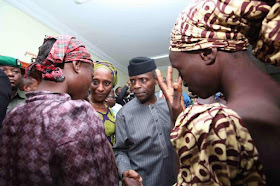 The Amnesty International has cautioned the Federal Government, FG, on the privacy of the twenty-one Chibok girls that regained their freedom on Thursday. The group cautioned that the privacy of the girls should be a priority. The Amnesty International’s Regional Advocacy Director, Netsanet Belay, in a statement, said: “The release of 21 of the kidnapped Chibok schoolgirls by the armed group Boko Haram is a big relief. “The government should also respect their privacy and ensure that the released girls are reunited with their families and not kept in lengthy detention and security screening which can only add to their suffering and plight. “However, it is vital now that they receive adequate physical and psychosocial counselling and support so that they can fully reintegrate in their communities. “Boko Haram members have executed and tortured thousands of civilians and raped and forced into marriage girls and women. They have been indoctrinated and even forced to fight for Boko Haram. “The Nigerian authorities must now do more to ensure the safe return of the thousands of women and girls, as well as men and boys abducted by Boko Haram,” the statement added. Recall that 21 of the girls were dropped off by the degraded Boko Haram group on Thursday at the Banki area of Borno state and they were picked up by military helicopter.